Please read these two posts first to familiarize yourself with the problem. Our class acquired a copy of the current postal route the mail carrier follows. The total driving distance in the development is 4.4 miles. 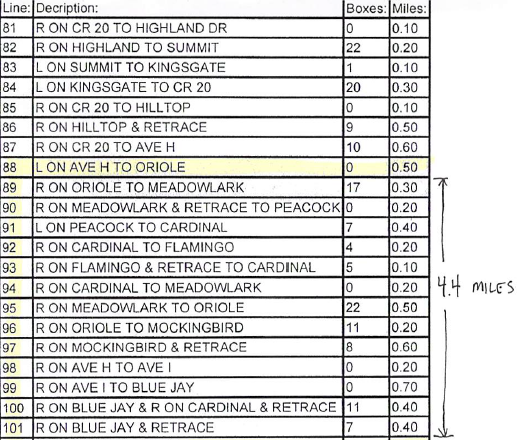 (The tabular values actually sum to 4.7 miles, but there is some round-off error due to distances being rounded to the nearest tenth of a mile). An image of the current postal route appears below. Our proposed route, which includes the administrator's desired mailbox location, saves the post office mail carrier approximately one mile per day. A PDF copy of our collaborative class summary report appears below. The administrator can use the information to approach the postal service about the mailbox location. Below is a Google Earth video created by the students displaying the optimal route they propose. Posted in PBL: Problem Based Learning, Uncategorized on October 26, 2013 by Shelby Aaberg.